The problem of data input into handheld computers and smartphones was revealed since their appearance. They were convenient to view downloaded info, but it was complicated to enter large data. The problem was hardly solved with the virtual keyboard on the touchscreen and the built-in QWERTY-keyboard, as the input speed was much slower than the combination of the full-size keyboard and the touch method with ten fingers. The manufacturers try several ways to accelerate text input – manuscript input, voice recognition, external input devices. Only one method works steadily – text input from the plugged external keyboard. Manuscript recognition is developing, though the process is far from being completed. As for the voice recognition, it is still in the egg. Plug the keyboard via the synchronization connector. Minuses: keyboards are incompatible with the devices by other makers; many models do not have such keyboard. Plug the standard USB-keyboard. The major plus: great variety of USB-keyboards that are cheap enough. Minuses: few devices with the USB-host; the cable is required. Infrared keyboards. Pluses: an average price, good compatibility with different models. Minuses: devices should be within direct visibility; the problem here is that different PDAs have IrDA located sometimes at unexpected places. Bluetooth-keyboards. The most promising and universal way of connection. Almost all modern PDAs and smartphones (with little exception) are equipped with the Bluetooth adapter. The connection doesn’t need the devices to be within direct visibility, as the process is wireless. No drivers are required (in theory with the duplex support of HID profile). Minuses: such keyboards are expensive (about $100); there are problems with the software. The keyboard we review today nominally belongs to the last kind. However it has little to do with the problem of text input, it has other destination. We’ll try to prove this thesis in our review. The history of the virtual keyboard in rooted in 2000 with the foundation of the Israeli company VKB Inc. (now the company is located in the US). Together with Siemens it had been working on the new technology for two years. The companies unveiled their technology in 2002 at the CeBIT 2002 show. To say it was a furor, it’s not enough. There were plenty of publications in most prestigious magazines and newspapers, real interest of the public didn’t lose the strength during a year after the first public demonstration (I remember I was greatly impressed by the video of the working keyboard then). 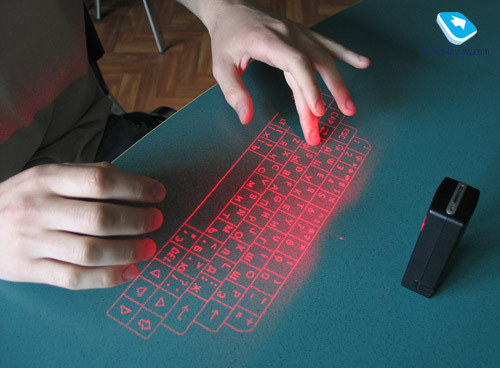 Some people even said such keyboards would remain in the future. Any company can only dream about such attention. However time passed by, but the keyboard hadn’t appeared in shops. A year after at CeBIT 2003 there was introduced a proto of Siemens SX1 with projected laser keyboard built in the top part. Alas, we haven’t seen this modification of Siemens SX1 in shops and had to wait for the keyboard much longer. The interest faded away gradually, many got disappointed in it believing it would never come out. Eventually it appeared, not as a built-in function of some device, but as a separate keyboard. 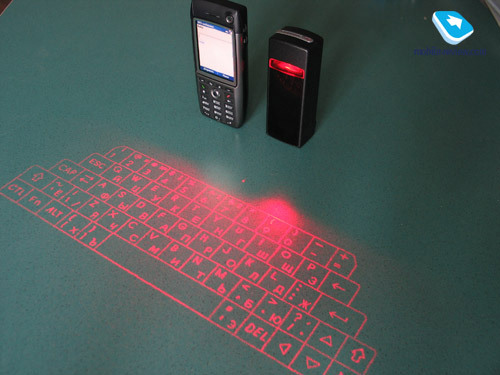 VKB Inc. signed a contract with i.Tech Dynamics Limited, the latter started production and distribution of a virtual keyboard under its mark. Official start of sales of the Bluetooth-keyboard falls on December 2004. Let’s try to explain with clear words how the keyboard works. 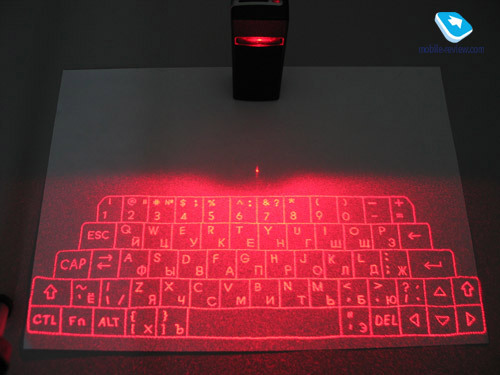 The QWERTY-keyboard image is projected with laser to a flat surface, Projection Module is involved. 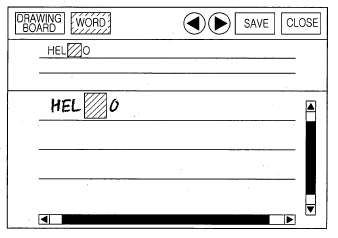 However the Module doesn’t take part in recognition of key strokes, you can switch it off and draw the keyboard on paper, for example. 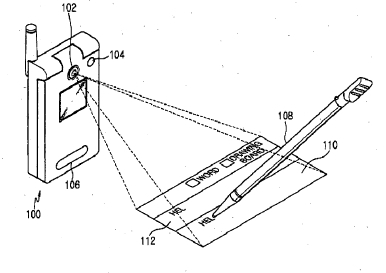 Micro-illumination Module recognizes key strokes. 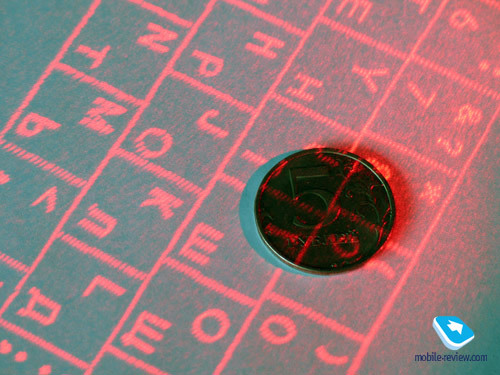 It creates invisible infrared field up 2 mm from the surface. 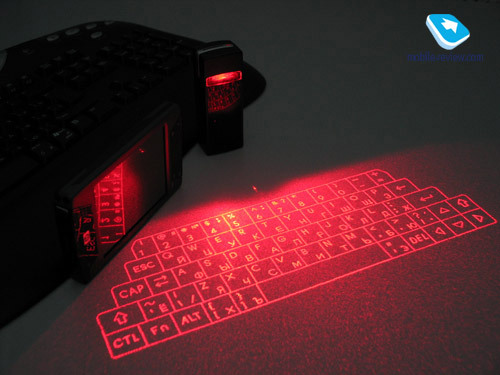 When the user touches a virtual key, the infrared ray gets reflected and the sensor catches this signal. The signal gets through the infrared filter and is displayed on the CMOS Sensor Chip. The Virtual Interface Processing Core locates the pressed key online. Then we pass to the simple thing – the recognized symbol (the code) is transferred to the receiving device via Bluetooth. Well, the construction of the keyboard is more difficult than it might seem on the face of it. 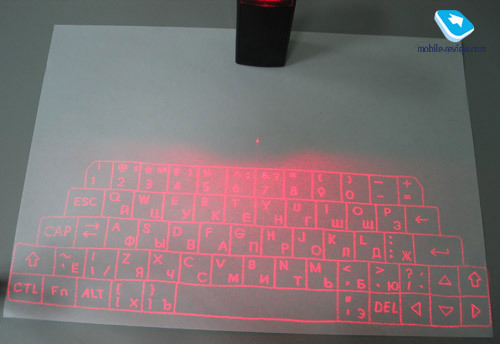 The laser is involved only in drawing the keyboard image on a flat surface (some users mistakenly think that the principle of the virtual keyboard is similar to the laser measuring tape). The main block of the keyboard is a black bar measuring 34x90x24 mm and weighing 80 g. In folding mode we have the smallest external QWERTY-keyboard, because there aren’t any keys, they are virtual and do not require space. The keyboard won’t take much place in your bag. 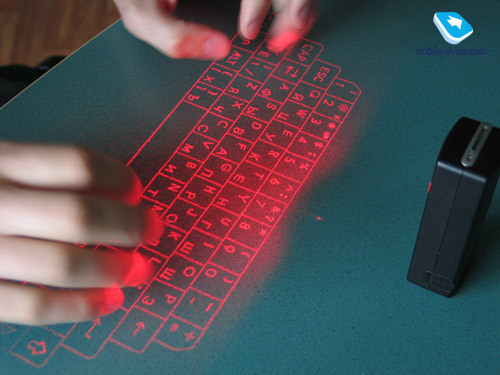 In fact this is the only keyboard, which you can carry with you in the pocket. This is the matter under question, whether to carry the keyboard with you in addition to the phone and the handheld. There might be not so many pockets. Think about it to make your own decision. The projection forms a right-angular trapezoid 95 mm high, 295 mm the bottom side. So this keyboard is narrower than the desktop “solid” analog, but wider than my 12” laptop. 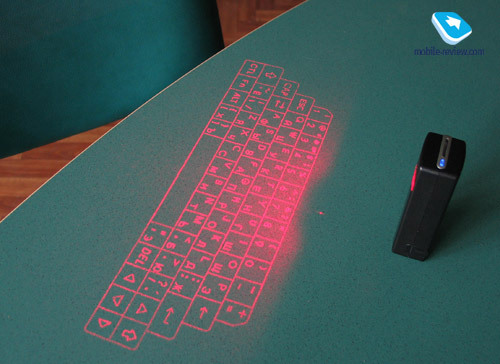 You can project the keyboard to almost any plain surface, the important thing is that the surface is really plain and solid. In this aspect the keyboard doesn’t require special conditions. To switch the keyboard on you have to put the block on a plain surface and press the button on the left side, that’s all. The opposite process is even simpler, you don’t have to press anything, just take it from the surface. Thus the button on the bottom is automatically switched off. In the power saving mode the keyboard gets switched off after it was several minutes idle, if you forgot about it. Now let’s speak about how to plug the keyboard to other devices. According to the Bluetooth ideology, you don’t need to install special drivers for each operating system, they are replaced by a higher level software – so-called profiles to receive a high compatibility. The connection of the keyboard involves HID profile (Human Interface Device). Luckily this profile is more often met in devices. If your device supports HID-profile, everything is simple – you just have to pair your notebook, smartphone or PDA with the keyboard and start working. I have an important notice: at this connection some fine settings of the keyboard might be idle (for example, you won’t see the battery charge level and there won’t be the Russian layout). However some settings can be resumed by a combination of keys (we’ll talk about it below). There is a more complicated way – using SPP Bluetooth profile (Serial Port Profile is supported by the majority of devices), which requires installation of drivers. These is one more weak point – every time you have to initiate Bluetooth-connection manually (with HID-profile the keyboard is automatically connected). Let’s see what else we can do with the keyboard. In its settings you can see the battery charge level, adjust the projection intensity (it’s possible to make it less bright or switch it off in the dark, for example). You can adjust sound effects produced by the keyboard or the connected device, access the settings of automatic shut down and sensitivity – there are 20 levels, the 10th level is set at default. You can play with settings, however you won’t gain much from it, the 10th level is actually optimal. As we’ve already mentioned, some settings can be activated by a combination of keys. 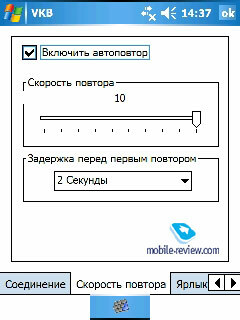 The parameters are similar in different operating systems, so we provide screenshots only for Windows Mobile version. If we want to connect the keyboard via HID-profile, our device should support it. In case of the SPP-connection, we should check the list of compatible devices. There is the support of the following operating systems: Blackberry, Palm OS 5, WM 2003 for PPC, WM 2003 for Smartphone, S60 (version 3 or higher), UIQ 2.x, Windows Mobile 5.0, Windows 2000/XP. The list of compatible devices is potentially long, due to the popularity of Bluetooth technology. We wish other connection ways provided such wide compatibility. After the first impression got weaker and the heartbeat is normal (it’s not everyday you face the technology of a fantastic movie), we start working with the keyboard. It seems to be the weakest part of the keyboard. Let’s start from the beginning. All the keys are visible well under not bright daylight or indoors, all lines and letters are legible. 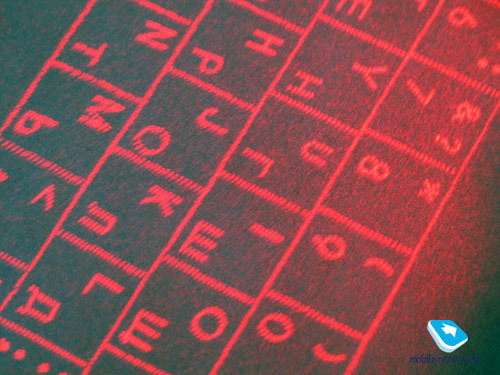 Under the lamp or direct sunlight the keyboard image is fading. You can still make it out, but you have to peer into it, involve your imagination to fancy the position of this or that key. Well, essential requirements imply a plain surface and absence of bright light. We can forget about the last condition, if we draw the keyboard layout on a paperboard, for example. Now let’s pass over to the layout and the keys. All keys are big, bigger than we used to see. There is no top row of functional keys (F1-F12 and some other), however the keyboard has the row of digital keys. The location of several Russian letters isn’t standard, it’ll take some time to get used to it. You won’t feel the sense of touch, as the keys are virtual. There might be a sound feedback to compensate for it (however you can switch it off). So, forget about a touch method with ten fingers, you’ll have to look at the keyboard often. According to the specifications the touch speed reaches 400 symbols per minute. But real figures are far from that. Even if you type very fast on the ordinary keyboard, be ready your type speed with the i.Tech Bluetooth Virtual keyboard will drop at first. Everyday exercise will improve the situation, but the result won’t the maximum possible with the ordinary keyboard. The most unpleasant thing is the high error percent (mistaken key stroke, simultaneous stroke of several keys), which can’t make the virtual keyboard a good substitute to ordinary input methods. I’d note that the error percent is in inverse relationship with the type speed. When we type with two fingers and very slow, there aren’t any errors. But when we use all thumbs and fingers, we have nothing good in result. Any way you’ll have to spend more that a day to streamline the balance of speed and the error percent. The keyboard is fed by a built-in battery. According to the manufacturer, the battery life amounts to 2 hours at continuous typing, in real tests we got even higher results. If we compare the virtual keyboard with the ordinary Bluetooth-keyboards, the i.Tech product has poor results (2 hours against 60 hours). Despite of the suspended release the keyboard isn’t outdated, because there aren’t such technologies on the market yet. 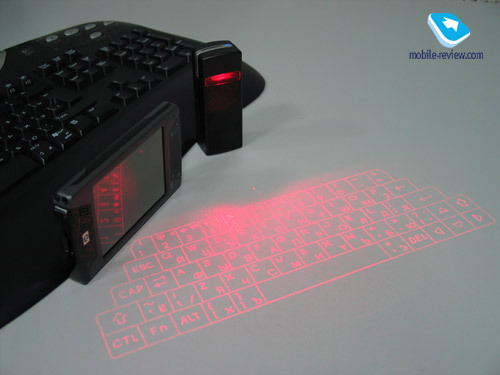 The i.Tech keyboard produces unreal impression at first, it seems to be something from a fantastic movie. I can hardly describe the effect the keyboard produced on people around. They forget about everything and behave like children, who see a toy from the dreams. It doesn’t matter whether you are interested in technologies or not. Even IT skeptics and progress opponents pay high attention to this new device. I think, the real laser sword from the Star Wars would have produced similar impression. However all these emotions take effect only at first, then the mind gets clearer gradually. First of all, the price for this solution makes up $200-250, which narrows the market of would-be buyers at once, not many users are ready to spend such money. Secondly, low text input speed is the main flaw, we believe. It’ll take you at least several days of practice to get used to the keyboard and achieve good results. 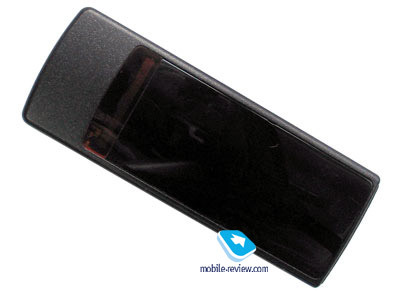 Thirdly, the keyboard features short battery life against the ordinary Bluetooth-keyboards – only 2 hours. At last, it requires a plain and solid surface and not bright light. 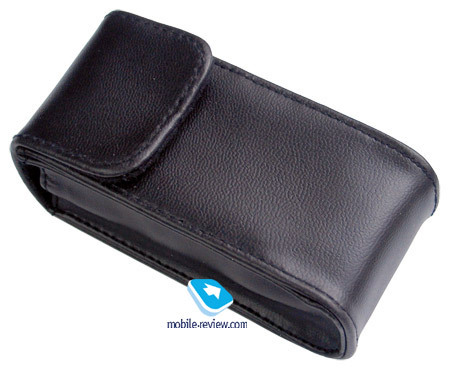 As for the advantages, it has the smallest size among the analogs and wide compatibility. Well, the keyboard in current conditions won’t be a mass one. This is a product for enthusiasts, who care about having exclusive technologies. In addition they’ll enjoy a WOW-effect, the attention of people around (for example, working with the keyboard in a cafe). At the same time you can expect the effect will remain in a half a year or a year, the technology won’t be distributed widely. The buyers from the technical enthusiasts group will find a perfect match with this keyboard. However if you need the keyboard to solve the problem of text input, you are likely to choose some other variant, taking into account price and ergonomics matters. Will the technology be a mass one? The matter is whether the company will manage to lower the cost of the solution, increase quality and speed of recognition, and battery life. I want to believe the technology will really become usual. I’d note that Samsung is working in the direction of similar methods, it has recently patented handwritten text recognition technology with the similar approach (see the picture above).